Happy Holiday’s everyone! A few more day’s left in Dec now and then the New Year! This fall and winter has been one for the books to say the least. The weather patterns have been more the way they should be after a few seasons of unseasonably warm temps. The Redfish seem to be happy for this change and are partaking in their normal habits of holding in the shallows most day’s of the week. This is the norm when the temps are this cool and the Louisiana Marsh waters are as clean as I’ve seen them in several years. As we all know clean water sight fishing is what the sport of Saltwater Fly Fishing is all about. The lack of wind this season has really been enjoyable too. Being able to go anywhere you need to most day’s is alway’s helpful. Louisiana has quickly become the premier destination for fly fishing redfish. The Delta is very large covering near 9,000 sq. miles of which all parts with over an inch of water hold food. These redfish are the apex predators once the waters drop bellow 70 degrees moving the sharks offshore. 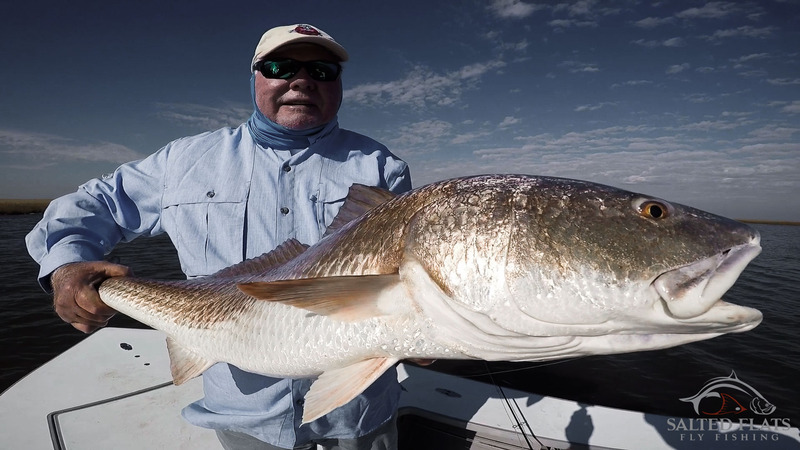 The redfish have safety and way more food than they can handle. All they do is grow. I have some February, March, and April dates available, Come join me!